You may not find Eddie Munster or Harry Potter under your stairs, but you can find plenty of unique ideas to transform this vacant area into a space that is both useful and charming. If organization is at the top of your home remodeling list, “smart storage” is the perfect way to expand the use of your staircase. This ingenious storage concept is both attractive and practical with many functional designs. The pull-out sections can be configured to hang extra coats/clothing, store racks of shoes, stock extra kitchen items, towels & linens, craft supplies, sports equipment and more. One of the more popular uses for the under stair area is for books. A library of books brings a warm and inviting feeling to your home–as well displaying your interests and revealing a bit of your personality. If you have more space, you can incorporate a small sitting area for reading–or transform the entire area into a reading nook where you can stretch out for hours of leisurely reading. These designs can include a window for extra comfort of reading by natural light. If books aren’t a main interest, you may decide on installing shelving for showcasing your collectibles, family photos, and other display items. Having an extra bathroom in the house is always a plus as general contractors will confirm this will undoubtedly increase the value of your home. Converting your under stair space into a powder room with toilet, sink, mirror and shelf is all you need to give your family a little extra space and privacy—along with convenience for guests. Another useful home renovation for under the staircase would be for office space. Instead of sacrificing a bedroom, you can have just about everything you need right under the stairs! There are many unique designs to turn this area into a comfortable and efficient little office. 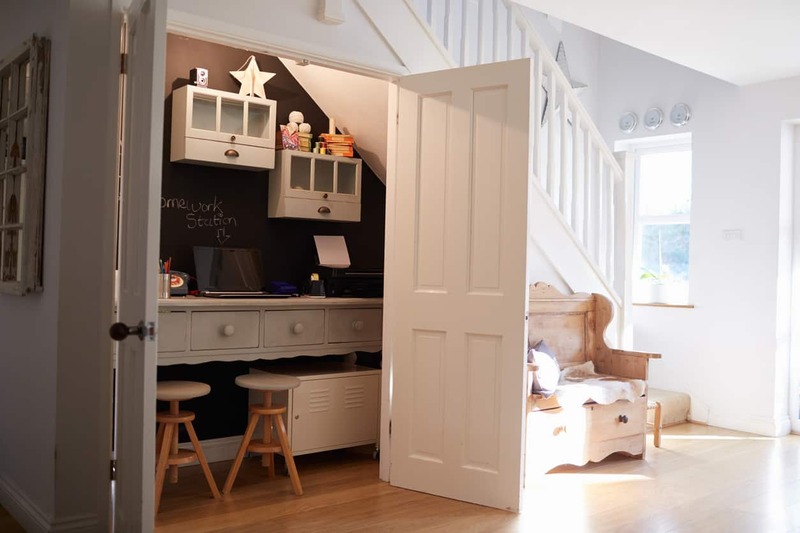 Families with children find that using the space under the stairs for cubbies and storage is very convenient. Cubbies with hooks for sweaters and jackets and pull out baskets for shoes/boots is a great way to keep your little ones’ things tidy and organized. If you’re a family that grocery shops in bulk and needs more room for your non-perishables, converting your under stair area into an extra pantry is a wonderful way to extend your kitchen space. For homeowners who love to entertain, transforming this area into a wet bar/kitchenette is another excellent way to utilize the space for storing/displaying liquor other than your kitchen. If your passion is wine, perhaps converting your space into a wine cellar/wine rack display would be ideal. Many homeowners spend thousands of dollars building a wine cellar in their basement, when you can save a bundle by creating an amazing display of your favorite vintages right under your stairs. Parents with young children may like the idea of transforming the under stair area into a playhouse. Outdoor playhouses are not always practical with weather interruptions and possible pest annoyances. This would provide an imaginative place for kids to have fun and entertain your kids for many years. Having a playhouse inside also allows you to keep a watchful eye on the kids and know they are having fun and are safe inside with you. Depending on the design of your staircase, you might think about installing a slide on the side of the stairs for extra fun and getting your kids downstairs for dinner on time! If you are a dog lover, you know that sometimes your best friend likes to have their own space to hang out in once in a while. Converting your under stair area into a cozy spot for your fluffy friend is a perfect way to show how much you love him.